When the lights go out at Litwak’s Arcade after a long day of grubby fingers jabbing buttons, the characters of its video game consoles can relax. One such character is Wreck-It Ralph (John C. Reilly), the destructive behemoth from thirty-year-old arcade warhorse 'Fix-It Felix Jr'. Ralph is unhappy with his lot as mindless antagonist and longs for acceptance from Felix (30 Rock’s Jack McBrayer) and the disgruntled residents of the building he smashes up day-in, day-out. 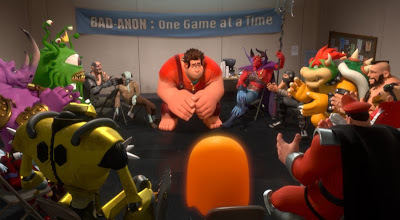 He attends a support group for similarly disgruntled bad guys but if he can’t find help there, there is always the frowned-upon possibility of going rogue and straying into another game to become the hero he longs to be. Seeking to instil the same reference-hungry joy in kids as the movie pastiche jukeboxes of Tarantino do in adults, Wreck-It Ralph’s setting in the world of video games presumably also hopes to tap into the nostalgic mania for all things retro in adult gamers. It is crammed full of appearances from the virtual stars of games like the 'Super Mario' series, 'Pac-Man' and 'Street Fighter II' as well as clever, non-copyright-infringing imitations of other well-known properties. It begins in economic, cameo-heavy fashion where it establishes the structure of the film’s world and that each game is connected via a commuter transport system. It initially has fun darting from game world to game world with consequent changes in the film’s entire look. The problem is that it soon exhausts that and drifts into a midsection that all-but forgets about video games – and dynamism. While the world of alien shoot-‘em-up ‘Hero’s Duty’ is swathed in darkness pinpointed by eerie greens and angular landscapes, the setting for most of the film is ‘Sugar Rush’; a twee kart racing game filled with scrumptious pastel landscapes. As the characters enter this candy land, it has a similar effect on the film’s pacing; it begins to feel like wading through caramel. Director Rich Moore spends just too much time having fun with confectionary and nefariously shoehorning in brand names to get back to the spark of the opening act. Reilly's titular character is a mopey delight. His hangdog expression is always at odds with the Day-Glo unreality of the worlds he inhabits but he is often outshone by the voice performances of Jane Lynch as a hard-bitten space marine and - once you can get over the fact she is playing a child - Sarah Silverman’s cutesy sidekick Vanellope von Schweetz is a sassy joy. Considering it is a film where the hero is ostensibly a reluctant villain it is lacking a real threatening force and the few there are get constantly thrown aside and forgotten about. The artistry of creating multiple aesthetically different realms which blend together into a seamless whole is never in doubt. It looks stunning. There is a ring of authenticity to each game but it cleverly avoids the pitfalls of looking and feeling like a video game itself. From the 8-bitty score to variant tics in animation style its influences are clear but rarely overbearing. There is the occasional inconsistency which comes as a result of pandering to audience expectations. It slightly grates that in Ralph's world, where everything has the slightest hint of pixelated edges (right down to food splatters), other characters move in an accurately herky-jerky fashion but somehow Ralph himself always has the smoothly rendered look of the CGI animated hero he is. The Pixar influence of Walt Disney Animation Studios' Svengali, John Lasseter, is clear in the innovative idea and plotting but it is lacking in a clear message which might have helped define it. It really boils down to the tried-and-tested 'accept differences in others' and ‘find your place’ messages which run through nearly every recent animation from every studio. There are times when it comes creepily close to bringing to mind dreaded terms like ‘brand synergy’ and you cannot help but feel the next step is for Disney to produce real-life versions of the in-film games as well as tie-in promotions with Nesquik and Oreos. It takes a neat concept (which is, admittedly, just an electronic update of Toy Story) and for a while nearly comes close to wrecking it. It is not a total write-off but it as it progresses it loses focus and forgets about the possibilities that were presented in the set-up. It dwells too long in the same location and only comes together for a spectacular conclusion which innovatively draws from every aspect of the film.